, it is important for you to start off slowly and pay attention to any pain you may feel when first performing the following exercises. There are 3 parts on the road to recovery. Whether you are looking to strengthen your knee due to knee pain or are looking to rehab post-injury or post-surgery, you need to work on 3 areas. These areas are increase range of motion, strengthen your knee and the areas surrounding your knee, and lastly, be able to combine the two with functional exercises. Lie on your back and bend your affected knee 90° with your foot flat against the wall. Slowly slide your foot down the wall by bending your knee as far as possible. Hold for 5-10 seconds and then slowly help raise the affected knee back using the healthy leg. Insert your foot through the loop of an exercise strap and lie on your stomach. 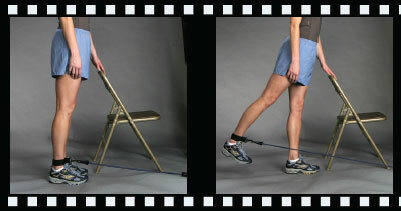 Gently pull the strap handle until your knee is flexed to the point of tightness. Hold for 5-10 seconds and then relax. Sit on the floor and fully extend your affected knee. Place a pillow under your ankle and a weight over your knee. Allow your knee to reach full extension by relaxing your muscles. Lie on your stomach with a pillow under your affected knee (this can also be done by hanging your knee off the end of a bed). Allow your leg to hang freely. 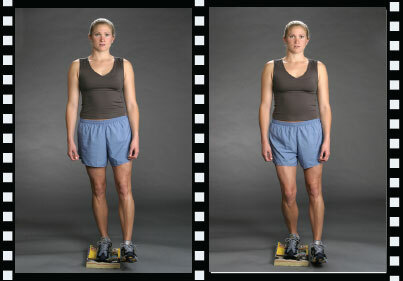 To assist in gaining full knee extension, a weight may be placed over your heel. Face a wall and stand with your rear leg straight and your front leg slightly bent. With you heels on the floor, lean towards the wall until the calf muscle in your rear leg is tight. Be sure not to bounce and hold the position for 10 seconds and then relax. Sit on the floor and put your feet together. Use your elbows to firmly push your knees outward. Hold for 10 seconds and then relax. Insert your foot through the loop of an exercise strap and lie on your back. While keeping your affected knee straight, pull the strap handle until your leg is tight. Hold for 5-10 seconds and relax. Repeat. Sit on the floor with your legs straight out in front of you. While keeping your toes pulled back towards you, tighten your thigh muscles. Hold for 5-10 seconds and then relax. Lie on your back and bend your healthy knee. Straighten the affected knee (place a weight on or around your foot or ankle for more resistance) and tighten the thigh muscle. Slowly lift the leg as high as the healthy knee. Bring the leg down slowly down to the floor. Face a wall and spread your feet shoulder width apart. Stand up on your toes as much as possible. Hold for 5-10 seconds and then relax. Sit on the floor and insert your foot through the loop of an exercise strap. Point your toes away from you while holding the end of the strap. Lie on your back and bend your healthy knee. Place a pillow under your affected knee (place a weight on or around your foot or ankle for more resistance). Tighten your thigh muscles and lift your heel off the ground without lifting your knee off the pillow. Keep your knee straight and hold for 5-10 seconds. Slowly lower your foot to the floor. Connect an exercise strap to your ankle and to a wall or stationary object. Sit in a chair, facing away from the wall or stationary object, and bend your knees 90°. Place a pillow under your affected knee and straighten your leg. 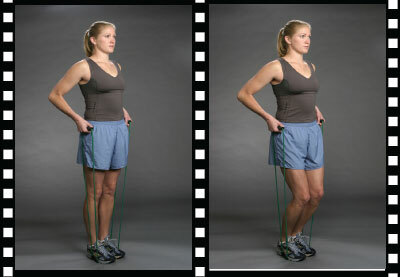 Connect an exercise strap to your ankle and to a wall or stationary object. Sit in a chair, facing towards the wall or stationary object, and straighten your affected knee. Flex your knee and bend it to 90º. Connect an exercise strap to your ankle and to a wall or stationary object. Stand up straight, facing away from the wall or stationary object, and use a chair to balance yourself. Raise your affected leg up, making sure to keep it straight. Lower it back to the starting position. 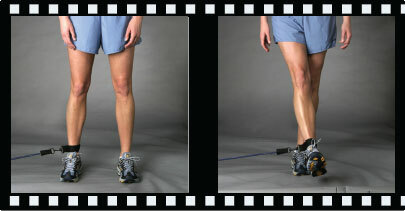 Connect an exercise strap to your ankle and to a wall or stationary object. 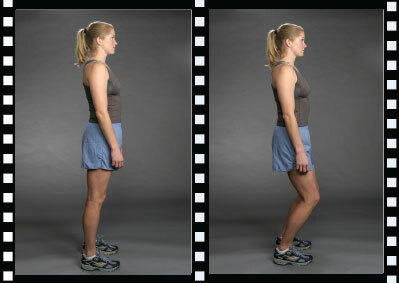 Stand up straight, facing towards the wall or stationary object, and use a chair to balance yourself. Raise your affected leg backwards, making sure to keep it straight. Lower it back to the starting position. Connect an exercise strap to your ankle and to a wall or stationary object. Stand up straight, facing sideways to the wall or stationary object, and use a chair to balance yourself. 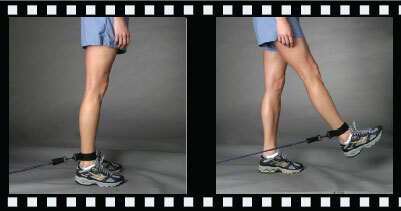 Pull the affected leg across in front of the healthy leg, making sure it is kept straight. Return it back to the starting position. 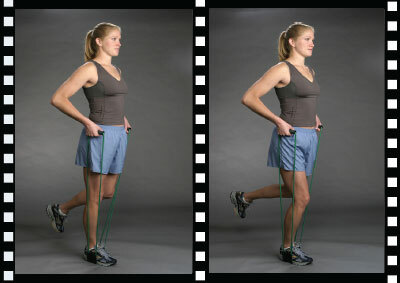 Connect an exercise strap to your ankle and to a wall or stationary object. Stand up straight, facing sideways to the wall or stationary object, and use a chair to balance yourself. Pull the affected leg away from the wall or stationary object, making sure it is kept straight. Return it back to the starting position. Stand with your feet shoulder-width apart. Keeping your feet straight, bend your knees until they barely cover your toes when you look down. Make sure to keep your weight mostly on your heels and your back straight. 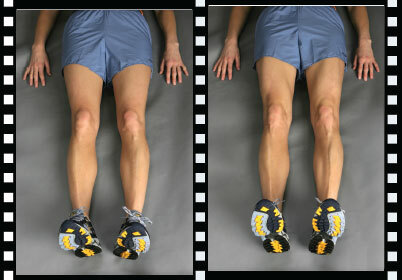 Return to a standing position so your knees are almost straight, but not "locked". Place both feet on the center of an exercise strap. Hold the handles at your sides until the strap is taut. Squat down and bend your knees 90º. Hold for one count and to a standing position. Place one foot on the center of an exercise strap. Hold the handles at your sides until the strap is taut. Squat down and bend your affected knee 90º. Hold for one count and to a standing position. Stand with the affected leg on a phonebook or step and let the healthy leg hang off with toes pointing upward. Bend the affected leg and touch the floor with the heel on your healthy leg. A chair may be used for balance. Balance on your affected leg only for 5-10 seconds.